Mitsurugi Kamui Hikae on the Playism Store | Bringing a different breed of indie game to the world. Enter the arena, take on a swarm of enemies and leave none standing in this action-fueled indie game. Collect skill points to upgrade your techniques and confront even greater foes. Feel a surge of pleasure as you make use of both swift attacks and destructive techniques to scatter your enemies! Mitsurugi focuses on high-speed arena-based action. Use lightning fast sword slashes, hand-to-hand attacks and mysterious ancient techniques to defeat wave after wave of demonic foes. Japanese high school girls and Japanese swords. 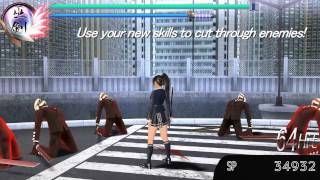 This combination has been done so many times in manga and anime but it’s not something you see much in games.This indie game was created from a desire to enjoy an action game with that classic schoolgirl sword combination as its core. What do you think about Mitsurugi Kamui Hikae? Indie Game circle Zenith Blue was formed in 2012. Primarily consisting of 3 members, the team focuses on creating action-focused titles. In 2013, they released their first title to the masses: Mitsurugi Kamui Hikae.